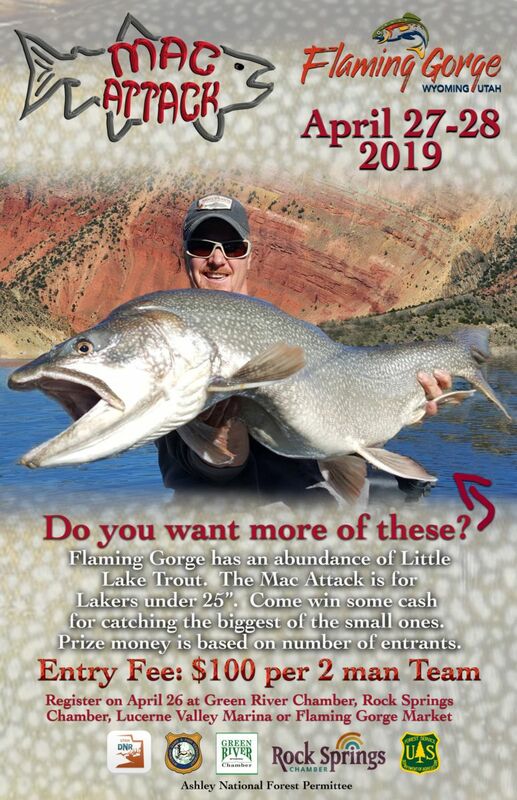 Flaming Gorge National Recreation Area, Wyoming/Utah… The Flaming Gorge Chamber of Commerce is pleased to announce a new fishing derby – the Mac Attack – to be held at Flaming Gorge Reservoir on April 26-28, 2019. Hone your Mac fishing skills and see how you stack up against other anglers during this Derby targeting lake trout less than 25 inches. The Mac Attack Derby is a partnership event between the Chamber, Wyoming Fish and Game Department and Utah Division of Wildlife Resources. It’s not always easy to maintain a renowned trophy fishery. The complex interaction of competing fish species and their ever-changing environment is a constant challenge for fishery managers. 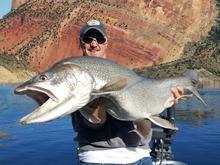 Flaming Gorge is well known as one of the greatest trophy fishing waters in the country. This 91-mile-long reservoir straddles the state line and currently holds 11 Wyoming and Utah fishing records. Social media sites are loaded with smiling anglers holding massive lake trout, kokanee salmon fishing has been off the charts for years, and rainbow and cutthroat trout populations are thriving. Both Wyoming Game & Fish Department and Utah Division of Wildlife Resources fishery managers work hard to keep it that way. In recent years, managers have noted a growing population of smaller lake trout, those less than 25 inches. In fact, they are thriving a bit too well. While all these small lake trout are providing excellent fishing and great table fare, is it possible that this is a problem? It is also known that this huge population of smaller lake trout will prey on other valued species in the Gorge, including kokanee salmon, rainbow trout and Bear River cutthroat trout. Reducing the number of small lake trout in the reservoir will help protect these species, reduce competition, and increase the growth rate of the remaining population. Thus, the Flaming Gorge Chamber of Commerce, Utah Division of Wildlife Resources and the Wyoming Game and Fish Department have joined forces to create a new fishing derby – the Mac Attack – to be held on April 27-28, 2019. The Green River and Rock Springs, Wyoming Chambers of Commerce have also committed to helping promote this new event. “We are excited about using the Mac Attack Derby as a vehicle to increase public awareness on how they can make a real impact on maintaining these trophy waters”, says Wilson. Teams of 2 anglers can compete for cash prizes by entering up to 12 lake trout (less than 25 inches) per angler, per day. Winners will be those teams with the most weight in fish. Any other team that checks in fish, but does not place in the most weight category, will be entered into a drawing for a cash participation prize as well. The event kicks off with on-site registration at multiple Utah and Wyoming locations on Friday, April 26, 2019. Locations include Flaming Gorge Market, Lucerne Marina, the Green River Chamber of Commerce and the Rock Springs Chamber of Commerce. Fishing takes place anywhere on Flaming Gorge Reservoir from 6am to 3pm on both Saturday and Sunday, and anglers can choose to fish from shore or boat. Three fish weigh-in locations will be open from 12 pm to 5 pm both Saturday and Sunday: Lucerne Marina Store parking lot, Wyoming Game and Fish Department office parking lot in Green River, WY and Cedar Springs Marina parking lot, near the fillet station. Fish must be checked in each tournament day. For more information about the tournament, contact the Green River office of Wyoming Game and Fish, the Dutch John office of the Utah Division of Wildlife Resources or www.visitflaminggorge.com. A team will consist of 2 members. All team members must fish together i.e. use the same boat, bank, etc. Passengers are allowed in the boat. Entry fee: $100.00 per team. This is a cash-in – cash-out derby. Please be prepared to pay entry fee in cash. Derby registrations: A team must be registered to be eligible for prizes. Registration will be Friday April 26, 2019, between 8:30 am-5:00 pm. Each member must register in person at one of the following locations: Lucerne Marina Store, UT, Flaming Gorge Market, Manila UT, Green River Chamber of Commerce, WY or Rock Springs Chamber of Commerce, WY on. After hours registration will also be available from 5 pm to 8 pm at the Flaming Gorge Market, Manila UT and Lucerne Marina Store, UT. All participants must sign an affidavit agreeing to comply with all derby rules. Any unregistered angler in your party may jeopardize the validity of your team’s catch and be grounds for disqualification. All of Flaming Gorge Reservoir is involved in the tournament, except for no fishing inside of the buoys at Buckboard, Lucerne and Cedar Springs Marinas. Official derby fishing hours: Thirty minutes before sunrise to 3 pm both Saturday and Sunday. Lucerne Marina Store parking lot, Wyoming Game and Fish Department office parking lot in Green River, WY and Cedar Springs Marina parking lot, near fillet station. Fish must be checked in each tournament day. No exceptions. Fish caught on Saturday cannot be entered again on Sunday. Weigh-in locations will close promptly at 5 pm. Any team that is not in line by 5 pm sharp, either day, will not be allowed to enter their fish in the tournament. To ensure fish are not entered both days, participants will be required to remove half of the tail fin after their fish have been checked in and prior to leaving the weigh-in location. Contestants are reminded that lake trout are a game fish and small lake trout are great table fare. Take care of them properly and enjoy eating them. It is unlawful for a person to take and leave, abandon, or allow any game fish or edible portion to intentionally or needlessly go to waste. The Derby committee claims no responsibility for accidents. It is highly recommended that all entrants wear life vests while on the water. The tournament is subject to cancellation or temporary suspension due to weather. Cancellation will be determined by tournament officials, the US Forest Service (USFS), Daggett County Sheriff’s Department, Sweetwater County Sherriff’s Department, Utah Division of Wildlife Resources (UDWR) or Wyoming Game and Fish Department (WGFD). Anglers may be notified by Marine Band Radio or text message. A USFS Recreation Use Pass may be required for anglers using certain areas in the Flaming Gorge National Recreation Area. It is the participant’s responsibility to be aware of those locations. If fishing in Wyoming and using an ATV, a Wyoming Off-road Vehicle Permit is required. It is your responsibility to make sure you are complying with all local, state and federal regulations. 13. All contestants must observe all US Coast Guard, Wyoming Game and Fish, Utah DWR, Utah State Parks, US Forest Service, and Daggett/Sweetwater County rules and regulations concerning sport fishing and safe boating on Flaming Gorge Reservoir. This includes UT and WY AIS regulations. Participants violating rules or regulations of any of the above will be disqualified. 14. Per Wyoming Game and Fish and Utah DWR: Culling is not permitted. The decision to release a fish or keep it for contest entry must be made immediately upon capture. Any fish caught that is not to be entered into the contest shall be immediately released to the water with as little injury to the fish as possible. Once a fish is put on a stringer, in a container or in a live well it cannot be released. Participants violating this rule will be disqualified. 15. AIS inspection requirements: Any contest watercraft coming from out of the state of Wyoming by land from March 1 through November 30 is required to undergo a mandatory inspection by an authorized AIS inspector prior to launching. Participants violating that regulation will be disqualified. Teams that launch and/or fish from a boat in Utah that do not present a copy of the Boater Aware Certification from Utah Division of Wildlife Resources with their entry fee before registration risk being disqualified. Computers will NOT be available to complete this certification, teams must plan ahead. Complete the certification at the following website: https:// dwrapps.utah.gov/wex/dbconnection.jsp?examnbr=510060. 16. Violation regulations: All contestants must abide by all Wyoming Game and Fish Department and Utah Division of Wildlife Resources regulations concerning fishing, aquatic invasive species and boating. Any participant found to violate any WGFD or UDWR regulation from thirty minutes before sunrise Saturday, April 27 until 3 pm Sunday, April 28 will be disqualified. Permitted by the Ashley National Forest Service, Wyoming Game and Fish Department, and Utah Division of Wildlife Resources. - This is a lake trout only derby. - Only lake trout with a total length less than 25 inches are eligible. - Each team member can enter up to 12 lake trout less than 25 inches per day. - Each team may enter up to 24 lake trout less than 25 inches per day and up to 48 for the derby. - The tie breaker will be the first team to enter their catch on Sunday. - Fish greater than 25 inches will be disqualified and not count towards the total weight. Derby officials make the final determination. - Winning team will be drawn from all eligible teams that check in one or more eligible lake trout both days. - Winners of the teams with most weight category are not eligible for the participation prize. Flaming Gorge Chamber of Commerce will post winners on their website - Flaminggorgecountry.com and on Facebook - flaminggorge. Prize money will be contingent on entries. Entry fees will be redistributed as prizes, therefore the more anglers that enter the derby the bigger the prize payouts. A small amount of entry fees may be used to defray derby costs (e.g. insurance, permit fees, etc.). Checks will be mailed to winners. Thank you for visiting http://www.flaminggorgecountry.com/mac-attack! Be sure and revisit flaminggorgecountry.com frequently for content updates and more.